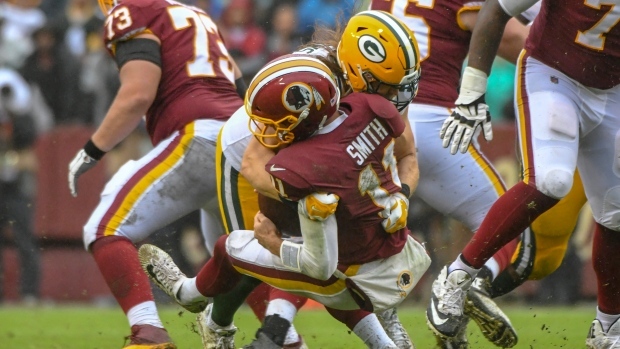 The NFL has re-emphasized the roughing-the-passer penalty this season, and while protecting quarterbacks is certainly an admirable goal, their decision has also generated some controversy as the first few weeks of the season has seen a noticeable uptick in flags for roughing. Referee Craig Wrolstad on Matthews penalty in pool report: "So, that's not a new rule. I had judged that the defender landed on the quarterback when he was tackling him, with most or all of his body weight, and that's not allowed. If you do that, it's roughing the passer." Either way, Matthews wasn’t happy, sounding off on the lack of leeway being afforded to defenders as they tackle quarterbacks. As he also notes, Matthews spoke to Washington quarterback Alex Smith after the game, asking if there was anything he could’ve done differently on the play while tackling him from the front. Finding the right balance between player safety and allowing football players to make reasonable football plays can be tricky, but it’s sure to be a conversation that continues as the league adjusts to the changing landscape.